If you're not 100% satisfied with your purchase, you can return your item(s) within 30 days of placing your order if you meet the below return conditions. Item(s) must be returned in the condition they were dispatched in. Returns cannot be sent with the shoe box taped up, written on or exposed. Please use either the original postage bag or an inside out plastic shopping bag. If you would like to visit one of our stores, we will be happy to provide you with an exchange, store credit or refund depending on your payment method. Find your nearest store here. You may also return your items online and you will be provided with a full refund, unfortunately, we can not facilitate exchanges when your order is returned to us in this manner. 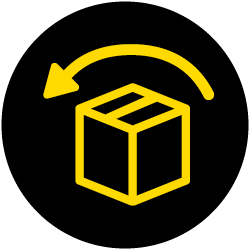 If you would like to post your item back to us, log in to My Account to book your return. If you checked out as a guest, use our Guest Returns Form here. Here you will be prompted to purchases either an Australia Post or StarTrack return label. Please allow time for your return to reach our fulfilment centre. This time may vary depending on your location. *Please note Gift Cards are non-refundable. To read our full policy, please click here. You can return any item to us in-store, just be sure to meet the conditions below and bring your proof of purchase. Your confirmation email is ideal! Remember, you can not return an item purchased with PayPal in-store - you'll need to post it back to us. Once you have dropped your parcel off at the Post Office or had it collected by Star Track, your return will reach us in 2-7 business days. Our top tip is to keep note of your tracking number, that way you can track your order and see when it reaches us. When your return arrives, it will be processed for a full refund within 2 business days. Your financial institution will complete this process, processing times can differ depending on the third party companies refund time frames. Card The refund turn around time will depend on your financial institution - most banks take around 2-5 working days to process refunds. PayPal PayPal will be in touch once they have finalised your refund and you will need then need to transfer said funds into your bank account if you wish. After taking the shipping, processing time and payment method into account, if you feel concerned about the progress of your refund, please get in touch. Unfortunately, if you paid with PayPal, you are unable to return to a store location for a refund. You are welcome to post your back to our online warehouse and we will refund you order in accordance with your original payment method. Unfortunately, we can not facilitate exchanges. PayPal will be in touch once they have finalised your refund and you will need then need to transfer said funds into your bank account if you wish. For instructions on how to return your item, please see our Returns Policy.